Why Choose a Hands-Free Faucet? Which Automatic Faucet is Right for You? Touchless faucets are the latest thing in kitchen fixtures. They use motion sensors to turn on and off automatically, so you don’t have to pull a lever every time you need water. They’re extremely convenient, and much more sanitary than traditional fixtures. Since nobody’s touching the faucet, there are fewer germs and icky dirt being tracked between you, your guests, and your family! However, with prices for touchless faucets ranging in the hundreds of dollars, it’s important to know you’re getting a high-quality fixture. Touchless models can be extremely nice, but they can also be very finicky and unreliable. We’ve done the research to figure out which models are currently the best on the market. We looked at price, build quality, special functions, and all the important specs. We also ran careful analysis of reviews by previous buyers, so we could get a sense of how these models held up over time! In this guide, we’ll show you the top 5 touchless faucets available today. Our in-depth reviews explain everything you need to know about these models, and help you figure out which one is the best purchase for you to make! First and foremost, it’s simply more convenient to have water turn on when you have your hands under the faucet. There’s no knob to turn, and you don’t have to worry about having a hand free or making some awkward maneuver to get water going. We also love that you never have to worry about making sure you turn the water completely off when you’re done. We’ve all been in a hurry and forgotten to check the faucet. All those drips waste a lot of water when you’re out of the house all day! That’s not a problem when your fixture shuts off automatically! We all go to the sink to wash our hands. That means our hands are dirty. Whether you’ve been working with money all day at work, cleaned up after a pet mess, or been handling raw meat, the dirt and germs on your hands isn’t something you want on your faucet. Annoyingly, by having to touch your faucet, you’re in a never-ending cycle of spreading those bacteria and nasties. Unless you’re careful to clean the faucet after each use, or to touch it with a clean part of your body, you can’t help getting something bad on the surface. A touchless faucet means fewer germs and bacteria in your kitchen, and safer food prep for you and your family! It’s a win-win for cleaning and food safety! Finally, who wouldn’t want to have a kitchen fixture this futuristic? Touchless faucets might not be an absolute necessity, but they’re incredibly cool to use. Plus, they’ll impress guests every time you have people over. Touch-on faucets are a good midpoint between traditional faucets and completely touchless systems. These ones turn on and off with a single touch, anywhere on the faucet. That really cuts down on germ contact, and gives you a lot more flexibility for tapping water on when you have your hands full or dirty. One of our favorites, and the top-selling touch-on model on Amazon, is this Delta. It’s a nice blend of old and new, with decorative curves and plenty of modern conveniences. We love the magnetic sprayer lock, as well as the extra high clearance. It fits both 1 and 3-hole sinks. The escutcheon is included, so there’s nothing extra to purchase for converting this one between formats! The spout swivels 360 degrees. It’s also a high-arc design, to give you more room to work underneath. We like high-arc fixtures for scrubbing out larger pots and bowls, as well as watering plants in the sink. It has a pull-down sprayer for added flexibility. The hose gives you almost 2 feet of spraying range, perfect for watering plants on the counter or cleaning around your sink. The pull-down sprayer has a magnetic lock for keeping it firmly retracted. Lots of lesser pull-downs sag, or leave slack in the hose, which makes it hard to get the solid shape of your spout back after you finish with the sprayer. We like Delta’s system because it goes right back in place every time. The spray head is super easy to keep clean and clear. It’s a “touch-clean” surface which Delta uses on all their shower heads, and have now integrated in their faucets. We like it because you don’t have to scrub off any hardened deposits. All the spray holes have little silicone nubs, which bend as you wipe across. That loosens all the sediment deposits, so they come away instantly. You can even do it with your finger, so it’s super easy. There’s a simple button on the spray head to switch between spray and stream modes. That’s a big upgrade on some traditional sprayers, which switch back and forth depending on your water pressure. It’s very well-made. This one is solid metal, with a stainless steel finish and a very sturdy handle. We also like the diamond-coated internal seals, which are very durable and prevent leaks. It’s a lot cheaper than a touchless model. Since it’s not a true touchless model, you will inevitably have to clean it a bit more often. As with most fixtures these days, this one comes with some plastic fittings on the supply lines. They’re pretty unreliable, so we’d recommend switching them out for the long term. Read more about each product below. Our most affordable recommendation for a touchless faucet is this Moen. It’s got all the hallmarks of a great finger-free fixture, with dual motion sensors, solid metal construction, and a reflexive pull-down sprayer. We love the spot-resistant finish. It’s coated with a spot-resistant finish. It’s designed to stay free of fingerprints or water spots from splashing, so you don’t have to clean it as often. When you do have to clean it, it wipes easily without any cleaners or scrubbing. It provides plenty of maneuverability. The high-arc spout gives you lots of room for cleaning large pots, pans, and dishes. You can also swivel the whole thing 100 degrees. There’s also a pull-down sprayer feature, for cleaning your sink, filling pots, or watering plants on the countertop. The pull-down hose has a special docking system which automatically retracts, even if you release the hose while it’s fully extended. We love that, given how annoying it can be to have a sprayer that won’t retract all the way. The hose is also designed to be extra flexible, so you can rinse anywhere you need in your sink. The manual knob on the side of the faucet adjusts temperature and pressure. It rotates forward, which means you don’t need much clearance behind your sink. It’s metal, too, which makes it extra durable. For touchless control, there are a few different options. The sensor on the top of the faucet is for simple on and off functions. It’s the best bet for getting a constant stream of water. The horizontal sensor on the shaft of the spout automatically turns on water when you move a dish or a hand in front of it. We like this one for quick, easy washing. It’s very easy to install. While a touchless faucet might seem like a big undertaking, this one comes with components that snap-lock together, so you can get it done without tools and elbow grease. That’s always a big plus for us! It uses an aerated spray system to save water while boosting flow. That means more rinsing power with a cheaper water bill for you! This model is limited to 2.0 GPM, which meets the EPA’s national WaterSense standards. It can be installed in either 1-hole or 3-hole sinks. The fittings for both are in the box. A few previous buyers reported internal leaks developing. This one seems particularly temperamental in that regard. Since that is the case, we wouldn’t recommend this one if you have expensive wood cabinetry around your sink. Some buyers had problems with the control boxes. The original ones had some electrical issues, which caused the sensors to stick or simply turn off. Judging by more recent reviews, Moen has fixed that problem. Some previous buyers found that the valves got stuck on, so they had to actually switch off the supply pipes to get water to stop. This Flow model from BioBidet is a simpler, but more reliable choice at about the same price as the Moen. We love the rugged s construction, as well as the uncomplicated motion-sensor setup. This is a great choice for people who want the convenience of touchless without too much technology getting in the way. It has a lot of the same features we love on the Moen: this one has a pull-down sprayer, extended reach hose, and a simple side lever for controlling temperature and pressure. The motion sensing system on this model is a bit simpler than the Moen. It’s suited to people who don’t like complicated features, and just want a convenient, sanitary on and off switch. There’s one sensor, and it just turns water on and off. No nonsense, no gestures, and no learning curve necessary! The sprayer head turns on automatically when it’s extended, and it’ll shut itself back off when the sprayer is retracted. There’s also a button for switching spray modes, just like the Moen. The internal valves are more reliable than the Moen. While that model uses lots of plastic parts on the inside, this one has brass fittings and a ceramic disc valve for added durability. We also love the auto-shutoff feature. It’ll turn water off after 3 minutes, so if you leave the water running, you won’t waste infinite amounts. This is also a good override if one of the sensors gets a bit moody. It’ll always reset every 3 minutes, so you don’t have to panic if a sensor stays on when it shouldn’t. The 17” high arc gives you just as much clearance as the Moen. It’s one of the tallest on the market, and more than clears large pots and pans. The 1.8 GPM flow rate meets strict water usage regulations without compromising on function. It’ll work in nearly any sink. This one can be installed in both 1-hole and 3-hole arrangements. An escutcheon is included in the box, too! You can get one of these to match practically any aesthetic, too. It’s available in chrome, nickel, and bronze variants. This one isn’t perfect in terms of reliability, but it’s a prominent seller and still maintains a solid track record for long-term performance. It’s one of the most reliable options on the market, and should last as long as any standard fixture. The Brantford combines traditional stylings and decorative curves with the modern convenience of motion sensors. We love the auto-retract sprayer feature, as well as the multiple spray settings. This is an affordable option for people with more traditional or rustic decor. It’s not much more expensive than the Moen or the BioBidet. The Brantford is only a few dollars more, but provides a big upgrade in terms of style. It’s also more versatile, thanks to the choice of several spray modes. It’s more traditional in look, but not in feel. The Brantford has lots of curves and some subtle ornamentation, which helps it blend in with older decor and more period styles. However, it still has the smart, dual motion sensors as the modern-looking models. We love that even the manual temperature/pressure handle has some nice ornamental touches to make it feel less utilitarian. Just like with the cheaper Moen, this one has a top sensor for turning flow on and off for longer periods, and a horizontal sensor on the shaft for quick rinses and washing. Previous buyers said these sensors are more fine-tuned than others they had used previously. They won’t be triggered accidentally by motion across the room. You can switch off the horizontal sensor, if you find that you reach across the sink pretty often in your daily routine. That’s a nice feature, since you can’t turn off sensors on some other models! The sprayer and hose work with the same “reflex” system as the cheaper Moen. Reviewers found it highly maneuverable, and didn’t report any issues with leaky hoses. There are a few different spray settings. All of them are aerated to boost flow without driving up your water bill. We really like the “boost” spray setting which helps rinse off tough food grime, as well as caked mud after you’ve been gardening! It’s extremely economical, thanks to a 1.5 GPM flow rate. With the aerator, you don’t feel like you’re missing anything in terms of pressure and body. Previous buyers said the hoses and fittings were just as well-made as the faucet, making this one more reliable than the cheaper Moen. It fits either 1 or 3 hole sinks, and comes with the fittings for both. This one also uses a quick-connect, click-lock system for installation, just like the cheaper Moen. The stainless finish is spot- and smudge-resistant, so you can clean less often. There’s only one finish option. This KOHLER model is one of the best-selling touchless models on the market. We love the unique aesthetic, which manages to be both modern and traditional at the same time. It’s loaded with some smart features, too, like a magnetic docking system on the spray head and a specially narrow motion sensor to prevent accidental turn-ons. It has very fast responsiveness, and a thoroughly reliable electronics system. It looks fantastic. The Sensate has a smooth, unadorned curve which looks modern, but adds a bit of flair with the tapered edges at the spout. The combination of clean lines and subtle curves allows this one to work with modern, minimal decor, and still not look out of place with older fixtures. It’s solidly built. This one is solid brass, with a smooth stainless finish. All the parts are made in Germany and assembled in the USA. The motion control system is state-of-the-art. While some other touchless systems have overactive or under-sensitive motion detectors, this one has a sensor that’s ultra-sensitive and yet which still manages to prevent accidental turn-ons. It’s a long, thin beam where other systems have big, round dots. That allows it to be more sensitive, but within a tighter area where you’re less likely to casually brush past. It has an A/C power pack, which eliminates the need for a battery. That means you never have to worry about your water shutting off in the middle of prepping for the big dinner. There’s a backup feature for using this faucet manually when the power’s out. It’s actually one of the only models on the market with a manual override. The pull-down sprayer has a special nylon hose and ball joint to help it move smoothly in and out of the spout. The ball joint allows for swiveling, and the braided nylon keeps things kink-free. We also love KOHLER’s magnetic lock system, which keeps the sprayer clicked back into place when you’re not using it. It makes a great change from those droopy sprayers that you have to shove back into place. The spray face is KOHLER’s MasterClean format, which has silicone nubs that easily loosen sediment and mineral buildup. You just wipe across, and any accumulation comes right off. We like these wipe-clean spray faces because they keep spray nozzles clean, and prevent corrosion damage inside the spray head. The 1.8 GPM flow rate balances efficiency and power to give you the best of both worlds. It exceeds the EPA’s WaterSense guidelines without giving you weak flow like some 1.5 GPM units. This one is very temperamental from a reliability standpoint. While the metal parts and the plumbing features are very durable, we’ve found that many previous buyers had issues with the electronics systems. They had mixed experiences with KOHLER’s customer service team, as well. We found that about 1 in 6 reviewers had some issues, although most of them said that the company shipped out replacement parts fairly quickly. It’s very expensive, especially given how unreliable it is. This top-of-the-line Moen is an elegant, modern choice for people looking for a high-end fixture. We love the simple, bold aesthetic, with its straight lines and sharp edges. Sadly, it’s become too unreliable for us to recommend with any confidence. That’s why we’re including it as a See Also rather than as one of our Top Three picks. It looks super classy. It’s perfect for modern, minimal decor, and complements your other stainless fixtures and appliances. The stainless steel finish resists spots and smudges. It wipes clean easily, and previous buyers said they didn’t have any problems with soap scum or sediment, even after a few months of use. The pull-down sprayer nozzle extends naturally from the spout, without standing out awkwardly. You can switch between spray and stream mode with a convenient button on the spray head. If the button is pressed, it’ll stay in spray mode regardless of the water pressure. That’s a big convenience over some older models, which alternate based on pressure. It has Moen’s reflexive hose system built into the sprayer. The pull-down spray head works off a special hose with swivel joints and plenty of range for reaching wherever you need it. Previous buyers were very impressed by the sprayer’s range, especially taking into account the swiveling spout! Even though this is a super fancy faucet, it’s easy to get up and running. All the pipes and joints are quick-connect, snap-lock parts. No need for a plumbing degree! Since it runs off a battery pack, you don’t have to know anything about wiring either. The adjustment lever is super simple, and gives you precise control over temperature and pressure. We love the super-slim design, which is less awkward and obtrusive than other side knobs. It’s very efficient, but doesn’t feel like it. The Moen has a 1.5 GPM flow rate, which exceeds both EPA and CA state guidelines for efficiency. However, it’s also got an aerator system built in. This enlarges all the water droplets so they rinse more effectively and feel fuller on your skin. It’s very expensive. Some previous buyers were disappointed by what they got for the money, but we noticed most of those reviews were from people who bought the chrome finish (which we would avoid). The plastic parts they complained about are nonexistent on the stainless version. One annoying design quirk on this model is that while you can engage the spray mode from the spray head, you can’t switch back to the stream mode with the same button. You have to actually switch the water off. It’s not a huge problem, but it’s a bit annoying, especially considering that cheaper models have a two-way switch. This model has spectacularly bad reliability ratings. Due to the risk of water damage, we can’t recommend it with any degree of confidence. Touchless models are always going to be a bit more expensive. The more expensive options are generally more reliable, although that’s not always the case. You’ll also pay more for all-metal build quality, as well as smart features like locking sprayers and multiple spray modes. Touchless faucets are, on the whole, less reliable than traditional fixtures. That’s because in addition to the usual pipes, valves, and joints, there’s an electronic system to think about. In fact, it’s usually the electronics that give out. Because issues are par for the course with most models, you should make sure you’ve got a lifetime warranty. Double check the terms before you buy, to make sure all the parts (including the electronics) are covered. You’ll also want to cover all the bases you’d cover with a normal fixture. Look for the maximum amount of metal parts, and make sure all the fittings are built to last. Pay special attention to the handle and the pull-down sprayer, since these parts generally take the most beating. Some companies skimp on them by using plastic, so that’s something you’ll want to watch out for. And just like with a traditional fixture, avoid chrome finishes like the plague. They’re a sure sign of plastic parts and cracks to come. TIP: One really great thing that’s come out of online shopping is add-on warranty coverage. A lot of times when you purchase appliances or equipment, you can add a few years of coverage at the checkout. It’s provided by a third party who only does warranty claims. So, if something happens during that add-on period, you can just call the warranty provider and have them take care of things. You don’t have to worry about some arduous runaround from a fixture company, or long waits and hassles to get a simple fix. Since touchless fixtures can be so unreliable, it’s a good idea to spend a bit of money on some extra insurance for yourself if that’s available. We don’t think extra warranties are worthwhile for traditional fixtures, but they’re always the safest bet with emerging gadgetry! Before you buy any fixture, and especially something as expensive as one of these models, make sure you know exactly what your space requires. Measure all around your sink, taking account of the backsplash, the clearance you want above the sink, and any other shelves, sills, or obstacles you need to be aware of. The choice here is between battery packs and A/C power. Batteries are easy to install, since you don’t need wiring under the sink. That can be tricky to install and waterproof properly. However, batteries eventually die. You’ll have to replace them, and risk having to do so in the middle of something important. Given that they last a year or so, though, there’s probably just as much a chance of A/C power cutting out with the same frequency. If you’re in an area of the country that experiences power outages somewhat regularly, you’ll want to know whether your touchless faucet has any manual override settings. Many touchless models won’t work without power. Look at battery back-ups, or consider whether you’ve got a generator on your property. Some more expensive options will work without any power, so you can always be sure you’ll have water. Of course, that will also depend on your water pump. Once you’ve found something that looks how you want and fits all your criteria, remember to do your homework and have a look at the warranty! See how long it will cover you, first of all. Like most plumbing fixtures, the vast majority of touchless options are insured for life. Not all are, though! Be sure to check the length of coverage from the manufacturer. If the warranty is only for a few years, we suggest either buying an extended add-on plan at checkout, or going with a different brand. See what’s actually covered, too! These are much more complex pieces of equipment than your average faucet. So, check to see whether everything’s covered for the same amount of time, and whether there are any parts that don’t come under the warranty umbrella. Finally, know the terms of the warranty. Hidden costs can add up quickly with these fixtures, so make sure you know whether you’ll be footing the bill for return shipping and so forth. If you’re interested in touchless faucets but a bit wary of the price tags, the Moen and MiKitchen are both affordable options for your kitchen. The Moen has lots of smart features, like multiple motion sensors and a very maneuverable hose design. It’s probably a “better” faucet than the BioBidet. However, it’s a bit complicated to learn, and some buyers had issues with the electronics over the long term. The BioBidet has fewer frills and features, which makes it a better choice for people who like simplicity and no nonsense. It’s also more reliable than the Moen, since all the fittings are made from metal. With that said, it doesn’t have as many features, or as smart of an interface. For people who want the convenience of a touchless fixture without the modern look that most models have, we highly recommend the Brantford. It’s a decent bargain, too, at a price right in between our budget recommendations and the top-of-the-line models. We’re especially impressed by the reliability on this model, as well as the aesthetic. The Brantford is the best bet for blending in with traditional decor and period settings. If you’re going for sleek and modern, though, this isn’t the fixture for you. While the KOHLER looks fantastic and is purportedly very nice, we aren’t super confident recommending it. Given the longevity issues we found, it seems like a safer bet to go with the Moen. However, you might be one of the lucky buyers who never runs into any issues. This model continues to be very popular, so it’s hard to write it off completely. If you need to find the very best touchless kitchen faucet, we would recommend the Moen Brantford for its affordable price paired with its elegant design. If none of our recommendations are quite up your alley, take a look at the best-selling touchless faucets on Amazon here! 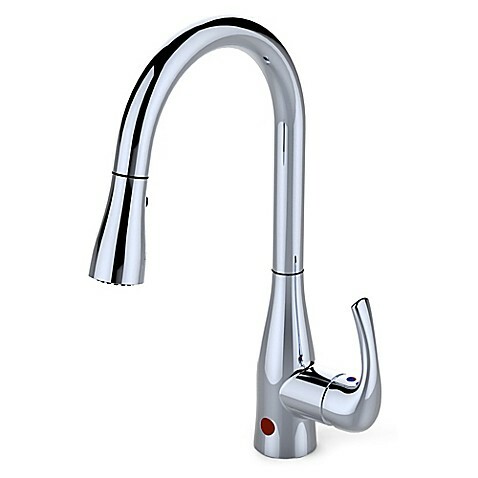 If you are looking for other kitchen faucets that aren’t touchless, visit our Best Kitchen Faucet Reviews.